June 18, 2018, EAB confirmed in a trap located in Superior CO - QUARANTINE BOUNDARIES REMAIN THE SAME - IT'S THE LAW; DON'T MOVE FIREWOOD OR ASH TREE WOOD OUT OF BOULDER COUNTY! March 22, 2018 EAB confirmed in Lyons - QUARANTINE BOUNDARIES REMAIN THE SAME. IT'S THE LAW; DON'T MOVE FIREWOOD OR ASH TREE WOOD OUTSIDE OF BOULDER COUNTY! HELP SLOW THE SPREAD OF EMERALD ASH BORER. Watch Your Ash is a multimedia project from graduate students at the University of Colorado providing an excellent overview of EAB detection and management in Boulder. Help protect Colorado's ash trees! Don't move firewood, and consider chemical treatments to protect high-value ash trees within or near the EAB Quarantine area. Find a company registered to handle ash tree trimming, treatment, removal and wood reuse – Listed Companies perform tree work in the Quarantine area and have formally agreed to abide by all of the applicable regulations imposed by the Emerald Ash Borer Quarantine. The following businesses can provide various services ranging from tree evaluations, pesticide treatment options, structural management/care, wood/mulch/chip resources, waste disposal as well as Emerald Ash Borer tree care management information. DOES MY TREE HAVE EAB? It is possible that EAB could infest an ash tree for 3 or 4 years before visible signs of decline appear. 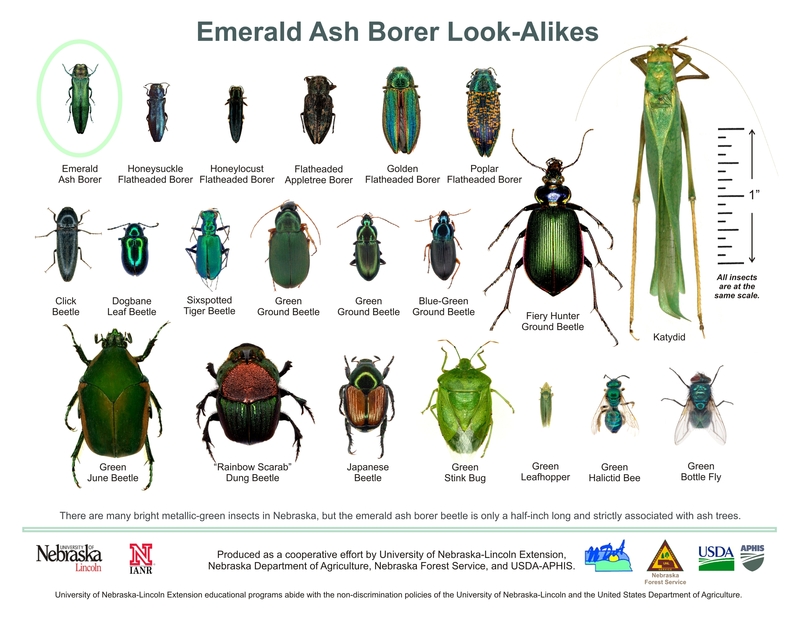 If you think you have EAB in your ash trees, have any questions or concerns, or would like additional information, please contact the Colorado Department of Agriculture at 888-248-5535, email CAPS.program@state.co.us or visit the EAB Identification and Reporting page. EAB only infests true ash trees (genus Fraxinus). Is your tree an ash tree? There are many other insects and environmental factors that can damage ash trees in Colorado including cold injury, soil conditions, improper planting (such as planting too deeply or leaving the cage and/or burlap intact), and insects such as lilac/ash borer and ash bark beetle. Don't be fooled by look-alikes! The Front Range Tree Recommendation List© was developed through the collaborative efforts of 12 individuals, three from each of the four participating professional groups: the American Society of Landscape Architects (ASLA), the Colorado Nursery & Greenhouse Association (CNGA), municipal arborists representing the Colorado Tree Coalition (CTC), and the Colorado State University (CSU) Extension. Based on the committee's collective education, knowledge, and experience, more than 250 trees or varieties were evaluated and rated, resulting in a single reference list for professionals to use and share with their customers or residents. Effective 11/12/2013, an emergency quarantine was issued to protect Colorado ash trees. See links below regarding the quarantine. List of Businesses with an EAB Compliance Agreement- These companies that perform tree work in the Quarantine area and have formally agreed to abide by all of the applicable regulations imposed by the Emerald Ash Borer Quarantine. The following businesses can provide various services ranging from tree evaluations, pesticide treatment options, structural management/care, wood/mulch/chip resources, waste disposal as well as Emerald Ash Borer tree care management information. Burn it where you buy it! The CAPS program is recommending that people use firewood from Colorado whenever possible, and to always ensure that their firewood is properly seasoned. In addition, when camping, people should try to buy firewood near their destination campground, to help prevent transporting pests elsewhere. Find local firewood dealers on the Colorado State Forest Service COWood website. Learn more about firewood best management practices.